This should have been so much better. I was hoping that the reboot of the Medal of Honor series would knock Call of Duty: Modern Warfare 2 from its perch. The entire drift of the Call of Duty series into nihilistic, over-the-top violence and mindless run-n-gun action has been unpleasant to watch. With the DICE team involved in Medal of Honor, there was hope that some of the qualities of their Battlefield series would find their way to the MoH. Alas, DICE was only responsible for the multiplayer portion of the game, while Danger Close (a rebranding of the EA Los Angeles studio) did the single player. EA LA has a decent pedigree. They were formed from pieces of Westwood Studios (one of the great development house of all time) and Dreamworks Interactive, and include people who worked on the original Medal of Honor series, as well as the Lord of the Rings: Battle for Middle Earth and Command & Conquer games. They almost do a great job with the Medal of Honor single player game, but the final product feels rushed, and too many flaws whittle away at the quality of the experience. Medal of Honor (2010) was designed to be a Call of Duty killer, and as such, it comes close before falling short of the mark. 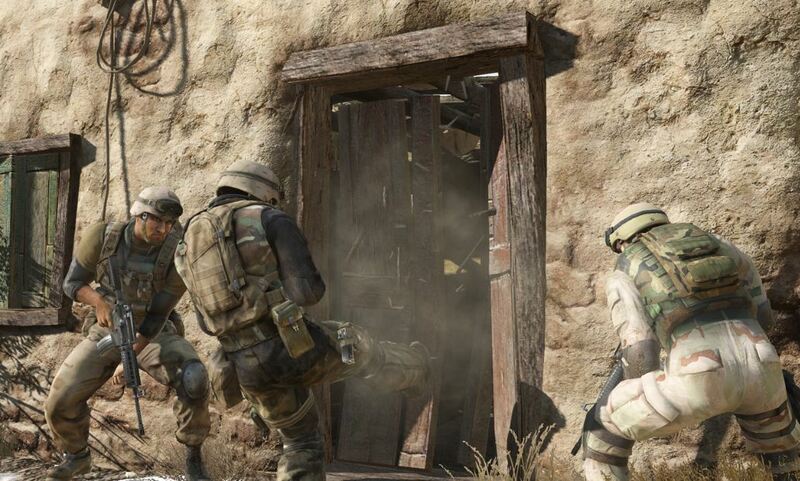 Where MW2 displays nothing but contempt for the American fighting man, Medal of Honor takes the opposite path. 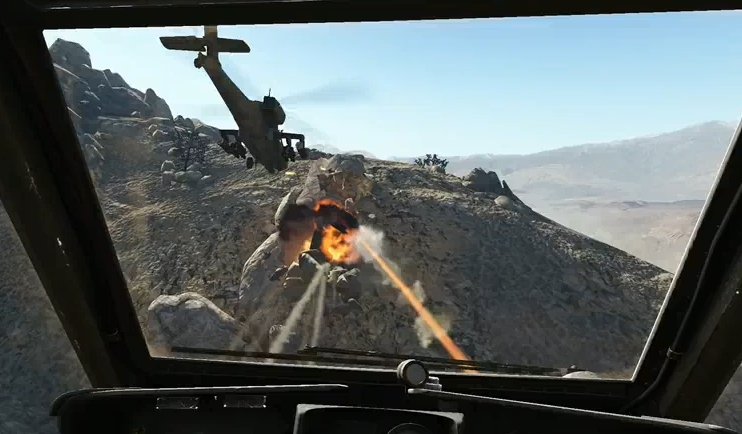 Working in close collaboration with military advisors, the developers wanted to create a realistic approximation of combat operations if present-day Afghanistan. This is reflected in the lingo, the mission types, the combined forces approach, and in a hundred other little ways. The focus shifts among 4 different US teams working under Special Operations Command, which is the unified command for the worldwide use of Army, Navy, and Air Force Special Ops. The player alternates among the Naval Special Warfare Development Group, Army Rangers, an Apache helicopter crew, and a team led by the ZZ Top-looking guy on the box, which I think is supposed to be Delta Force. The focus is thus meant to alternate between the “Tier 1” operators (the special forces who work in small teams deep in enemy territory) and the conventional land and air forces. All of this works well, with each team’s missions nicely dovetailed together so that one narrative ultimately converges with another. The emphasis is on the dangers these men face, the way they interact, and the nature of the ground war in Afghanistan during Operation Enduring Freedom in 2002. The overall design and tone are strong, with a diverse selection of weapons and mission types and a good sense of pacing. Small problems, however, can easily overwhelm a strong design, and that’s the situation with Medal of Honor. I’m not sure if there are serious scripting bugs, an environmental bug or quirk that prevents the triggering of certain actions, or what, but there are several places where the game is simply broken. During one sequence, you need to wait for some enemy forces to walk away from a truck, leaving one guy alone. Logically, you should kill that guy and move on, but no. This triggers a counter-response that you were trying to prevent. Perhaps your partner was supposed to give a go-code, but he never does. The mission simply gets stuck. This happens twice more in the same level. You’re supposed to be able to sneak by the enemy to put some transmitters on a truck, but either you’re never given the go-code, or you’re given the code and the enemy sees you anyway. The only way out of the mission is to kill everyone, which was not the goal. Enemy AI is either too heavily scripted or brain dead. After awhile, the game simply resembles a shooting gallery, as you pick off endless waves of Taliban. For all the fuss about including real-world enemies in the game, they might as well have included little duckies going around and around on a conveyor belt. Sometimes a shot can strike an enemy in the leg and he won’t even turn around: he just stands there looking at the pretty sunrise. Visually, the game offers some beautiful and effective scenes and environements, but too often the graphics just don’t make the grade. The single-player game uses the Unreal 3 engine, which was a mistake. Textures are bland and the shadows are sometimes so jaggy they look like saws. Pop-in is prevalent, and any time more than one thing explodes onscreen, the frame-rate drops into the single digits. In 2010, there is simply no excuse for this. Also: there are multiple quad-bike sequences. Seriously. I don’t care if Delta Force does tool around the Afghan hills on quads. I’m sure they also eat MREs, sleep, and go to the bathroom. That doesn’t mean I want to simulate it. All of this seems to indicate a game that simply didn’t spend enough time in development. There’s a rushed feeling to it. And though Danger Close gets the big picture right, they suffer the death of a thousand cuts due to the small things they get wrong. I can’t help thinking this whole project would have been better off left in the hands of DICE, but even there, things don’t quite add up. DICE used their own Frostbite engine to create the multiplayer portion of the game, which tries to find a middle ground between the fast pace of Modern Warfare 2 and the more complex, multi-aspect warfare modeled in their own Battlefield series. The result is … okay. I’m just not quite sure who it’s meant for. No Battlefield player would abandon Bad Company 2 for this scaled back, far-simpler approach to multiplayer. But no Modern Warfare 2 fan is likely to choose the less intense experience of Medal of Honor multiplayer. In trying to find a middle ground between the two, it simply ends up lost. Don’t get me wrong: the multiplayer is quite good, and proves that the Frostbite engine, rather than Unreal, should have been used for the single player game. Modern military shooters, however, have split into two camps: the fastfastfast action of MW2 and the multi-aspect, goal-driven action of BC2. There really isn’t any place for something in the middle, and that’s what Medal of Honor offers. I know I’ve been harping on the negatives throughout this post, so let me just step back and restate my opinion: this is a good game with a lot of little flaws. Those flaws stand out all the more because they are set within a game with so much potential. There is a last-stand scenarios where the Rangers hold off wave after wave of Taliban that is as tense as anything I’ve seen. Even the Apache levels, which are just rail shooters, are a blast. And the controversy, it turns out, was all much ado about very little. The game twists itself into knots to be respectful of the American military. There’s an amusing moment right at the beginning, where you’re riding in a truck with a driver dressed like mujahedeen. The radio blares that horrible cats-in-heat music common to the region. You assume that you’re beginning the game as the bad guy, and thoughts of Modern Warfare 2’s “No Russian” level come to mind. Then the “Taliban” driver says in an American accent, “Let’s turn that [crap] off,” and you realize that they’re Special Forces in disguise. It’s a good moment, and signals that this is not going to be a retread of MW2’s nasty, anti-American tone. As for “playing as the Taliban” … big deal. EA has changed the enemy’s name to OpFor (Opposing Forces), but they’re still armed and dressed as Taliban. I admit that spawning as a bad guy who’s fighting against US forces may be unappealing to some, but when you play cowboys and Indians or cops and robbers, someone has to be the bad guy. And at no point in the game are the Taliban anything other than the bad guy. There is no moral gray area here, as there was in the murky moral landscape of MW2. This is a game about good men doing hard work to protect people. I just wish they’d taken a little more time to get the small details right. Holy smokes, has it really been 10 years since Super Monkey Ball debuted on the GameCube? I loved the gameplay of the original, but I haven’t revisited it in years. The idea that I can now carry it around in my pocket still blows my mind. And Super Monkey Ball 2 does a great job of blowing the mind. This is the entire Monkey Ball experience crammed into an app and given the kind of control system it always demanded. It’s almost absurd that you can buy gameplay this good for a few bucks. The gameboard is essentially a giant, elaborate tilt-maze with a beginning and an end. A monkey is inside a sphere, sort of like a hamster in an exercise ball. Anyway, you don’t ever control the monkey. You control the level itself, which is suspended far above the world below. Tilting the device forward tilts the landscape and makes the monkey roll forward; backwards slows him down. Left and right take care of steering. The object is to get the monkey from the start of the level to the end while trying to collect bananas along the way. Bananas equal extra lives. And those extra lives are necessary, because this is not a monkey-friendly environment. It’s all too easy for the little monkey to slide right off the edge of the landscape and plummet to his monkey death. This is actually fairly unnerving, particularly if you have a fear of heights. The result is tense, challenging combination of maze and arcade game. Levels get progressively more complex and elaborate, with rails, hairpin turns, slamming doors, hammers, and other threats. Super Monkey Ball 2 absolutely nails the control scheme. The first Super Monkey Ball was one of the early releases to the app store, and this improves upon it in every way. 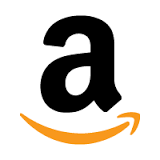 The sequel piles on the extra features by including 115 levels, a set of minigames (monkey bowling, monkey golf, and monkey target) and multiplayer support via WiFi. 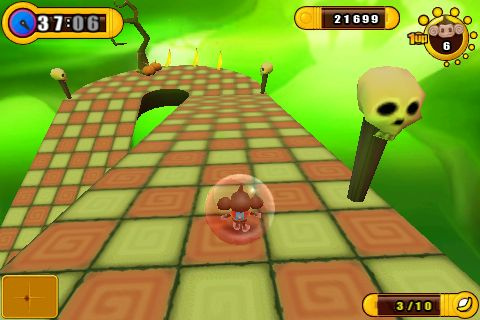 The 3D graphics are exceptional, and controls are more sensitive and responsive than those found in the first Super Monkey Ball. It still takes a good 5-10 minutes to get a grip on the control, but once you do it becomes second nature. Some people may complain that the price is “high” at $6, but those are the kind of people I tend to ignore. DS games of this quality regularly sell for $30, and if you keep an eye on this one, you can sometimes find it discounted to $2.